I am well on my way to that beach ready body. I've been working out 5 days a week, chugging water like a madman, and eating tons of fruits and veggies. I really don't mind any of it. Especially the eating healthy part. When I cut out alot of the processed junk in my diet, I'm reminded of how fresh, bright and flavorful clean eating can be. Coincidentally, my daughter has declared that my favorite food is salads because I eat them so much. And I have to say, I do love salads. As much as I feel great about cleaning up my diet, I find myself daydreaming about my favorite not-so-good-for-me foods. Cheesesteaks, baked mac and cheese, potato chips...my weaknesses. Sometimes a girl just wants some rich indulgent deliciousness. Lightening up a dish can be easy though; scale back the butter a little, swap an ingredient for a healthier option, use milk instead of heavy cream. There's all kinds of ways to make a meal healthier. Then there's the recipes that are only really good in their full fat, creamy, buttery, clog-your-artery goodness. And Beer Cheese Soup was one of those recipes that I thought wouldn't be good in a lightened up version. I mean, come on. Beer and cheese don't exactly scream healthy. Nevertheless, I decided to give this Skinny Beer Cheese Soup a whirl in hopes of keeping up the weight loss momentum I've got going on. I will admit, I was wrong. Beer Cheese Soup CAN be lightened up and still taste amazing. This soup only has 393 calories in two cups of soup. 2 CUPS, people! That's a LOT of soup! You gotta try it! In a small saucepan, simmer 2 cups of chicken broth and the potato for 15 minutes or until the potato is tender. Transfer the potato mixture to your blender and take out the center piece of the blender lid to let the steam escape. Put a clean dish towel over the top of the blender to avoid splatter. Blend until smooth. Set aside. In a large dutch oven, melt the butter oven medium heat. Add the onion, celery and carrot to the pan and saute for 5 minutes, stirring occasionally. Add the garlic to the pan and cook for 30 seconds more. Whisk together the flour, remaining broth, and milk in a medium bowl. Add this mixture to the dutch oven and bring to a boil. Boil for 1 minute, stirring constantly with a whisk. Add the potato mixture, shredded cheese, dry mustard, worcestershire, pepper and salt to the soup. Stir constantly for one more minute (until the cheese melts). Also picture is grilled cheese made with Best Basic White Bread (coming soon to The Two Bite Club). 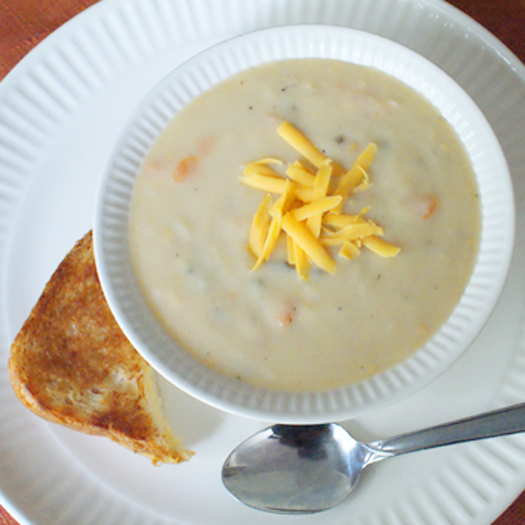 Source: Adapted from Beer Cheese Soup - Cooking Light Magazine.